In this article, Professor Charles Burnett, a world expert in the history of Islamic influences in Europe at The Warburg Institute (London University), retraces the impact the Latin translations of Arabic texts of science and philosophy had on the intellectual progress of Europe in the decisive period that preceded and prepared the Renaissance. The article is based on an interview conducted with him in 2004. Imagine a period in history, a time when Arab and Islamic cultures were at their zenith, renowned for their learning and scholarship. Aspiring scholars from the world over, flocked to these centres to get the best education money could buy. Figure 1: Professor Charles Burnett. Some of these centres were privately run Madrasas (schools), attached to mosques, with a wide ranging curriculum that focused on both religious and secular higher education. You did not have to be a Muslim to attend a course of learning at these Madrassas. By contrast enrolling at a university in medieval Europe was the first step to taking holy orders and to priesthood. Thus not only were European institutions of higher learning not open to Jews and Muslims but they were also closed to Christian scholars who wanted to fulfill their educational aspirations without having to take up holy orders. Hence Christian and Jewish scholars who were in a position to, also sought out these Madrassas and were not averse to the opportunity of being instructed by the leading scholars of the Muslim world of that time, not only in secular courses but also in Bible and Torah studies. In other words these Madrassas were all round institutions of adult learning that had an international reputation and appeal that crossed religious and political divides. Today the tables have turned and it is scholars from Islamic lands – those who can, who flock West to immerse themselves not only in the best modern education money can buy, but also to rediscover the golden age of Islamic learning. It is now the Western scholars who have taken on the role of preserving and unlocking the old Arabic texts that hold the details of what Muslims conveyed to the Europe of the middle ages. When the Islamic world wakes up from its current fit of collective slumber and despair, Muslim scholars will hark back to appreciate the work of a coterie of Western scholars who have kept alive the study of the Islamic contribution to sciences and culture and who are bringing to light the common past of the European Islamic current that binds two great civilizations together and which gave rise to that period in the emergence of European civilisation. The field is wide indeed, as revealed by a cursory glance through his comprehensive list of publications, making it clear that the Arab and Islamic influences on the Europe of the middle ages was not just about the history of mathematics and astronomy, important as these were in themselves, but encompassed wide ranging influences that had far reaching consequences in catalyzing the seismic shift that catapulted Europe into the modern age. Figure 2: A page from the Latin translation of Euclid's Elements done from Arabic by Adelard of Bath, edited by Giovanni Campano Novarese. Venice: Erhard Ratdolt, 1482. (Source). In focusing on the Arabic and Islamic roots of the revival of sciences in Europe, Burnett's work is influential in persuading historians to re-evaluate the renaissance. Some scholars are even now disputing the validity of the term and the historical period it covered. It is being suggested that, renaissance, a French word, was not the term the Europeans of the time used to describe the changes that were afoot in their society, when Europe was emerging from it's long sleep of the so called "dark ages". For instance in Italy the period that is now named the renaissance was known as 'rinascita' meaning rebirth. By this was meant the rebirth of classical culture and the rediscovery of the knowledge of antiquity. The term renaissance was in fact used for the first time in the 19th century, by which time attitudes had hardened. Europeans had replaced Muslims as the colonial force to be reckoned with, and were not only making exponential advances in science and technology but were using this knowledge to remake the world and now saw themselves in an evangelical light as belonging to a superior civilization that was 'bequeathing' the gift of science to the rest of the world. It has been suggested that this is when the centuries covering the renaissance came to be regarded as uniquely a European phenomena that did not rely on any input of other civilizations and that if Arab and Islamic cultures contributed in any way they did so only as agents and made no original contribution to the flowering of science and technology in the West. Although being mere agents was in itself would have been no mean achievement for as Burnett points out "it's very important even to be a conveyor, to understand scientific knowledge and culture and pass it on". To institutionalise a top down policy of mining all seams of existing knowledge systematically, add to it and refine it was indeed a marathon undertaking but "they did so much more and this is being increasingly recognised in recent scholarship". The notion that Arabs were agents only does not stand close scrutiny and has arisen, he says because of the lamentable tendency of many Western scholars to restrict the study of Arabic science and philosophy from the classical period to the 12th century and "not take any notice of what happened in the Islamic world after the 12th century, which is after the death of Avarroes in 1198". Averroes or Abū l-Walīd Muhammad Ibn Rushd, from Cordoba in Spain? was regarded by Medieval Europe as the greatest scholar of the Muslim world. As a prominent doctor of medicine, a philosopher and as someone who did service as a judge in Cordoba and in Morocco, Ibn Rushd certainly embraced a unique amalgam of science, philosophy, religion and jurisprudence. But the reverence for this undoubtedly great scientist and thinker had a downside in that it imposed a self-limiting approach based on the assumption that scholarship in the Islamic world climaxed during his life time and came to an end with his death. As a consequence "Arabic authorities were simply not considered important" as reference points after the 12th century. The idea that the Islamic world came to a standstill after the death of its most famous scientist and philosopher is "certainly not true" says Burnett and "it is now being realized that scholarship continued in the Islamic world" and "some of the greatest Islamic scholars came after this period". Why then that whilst history records the achievements of great scientists such as Galileo, Newton and Copernicus, Muslim scientists are conspicuous by their absence and even when they get a mention who knows what they were known for. Burnett counters that Scientists like Nasīr ad-Dīn al-Tūsī who came after the death of Ibn Rushd were "very great scientists by any reckoning" and that in any case today "most people would find it difficult to say what Galileo was known for" even if there is a lingering perception that he was a great scientist. Figure 3: Front cover of The Cross and the Crescent: The Dramatic Story of the Earliest Encounters Between Christians and Muslims by Richard Fletcher (Penguin Books, 2005). Burnett began his academic life not as a scholar of Arabic as one might imagine but as a scholar of Latin and Greek and credits his 6th form teacher at Manchester Grammar School, with being the one to trigger his interest in the close relationship between Latin, Greek and Arabic scholarship that existed in medieval times. He recalls the words of his teacher who told him that: "The European Renaissance was caused by the flowing together of two great rivers of knowledge. One came directly from the Greek through Greek exiles from Constantinople and a second river meandered from ancient Greek /Latin civilizations through the Islamic world, through translations from Greek into Arabic and then washed back into Europe. It was the merging of these two rivers that caused the renaissance and the rise of the modern era and of modern science in Europe". More inspiration to investigate the confluence and merging of these two rivers came when he went to St John's College, Cambridge to read Latin and to ponder on the topic of his doctorate research. His tutor in Medieval Latin, the eminent Peter Dronke, gave him a book called Studies in the History of Medieval Science by Charles Haskins, an American historian. Haskins too lent great weight to the importance of Arabic sources for medieval science and his book inspired Burnett to select a text on cosmology by one Hermann of Carinthia, as his research topic. The text – On the Essences, focused on the universe, "embracing celestial and terrestrial physics and on the nature of man, the 'little cosmos'" and used both Arabic and Latin sources. Hermann of Carinthia was a 12th century scholar, originally from what is present day Croatia. He studied in Chatres and is known for having translated many Arabic manuscripts into Latin in Spain and Southern France. In fact as Burnett subsequently discovered all of Hermann's other works were direct translations from Arabic. The links between medieval Latin and Arabic were becoming obvious and it became an imperative to learn Arabic in order to get more of a handle on his chosen area of research. "I began to do this in an informal way by reading Arabic texts with people in Cambridge" he says, "and as soon as I started learning Arabic I realized I knew some Arabic already". Learning Arabic rekindled memories of his childhood in East Africa where his father had taught at a mission school and where he had grown up speaking Swahili, an East African language derived in part from Arabic. Being reconnected to his past brought to the surface the Arabic words he had known and spoken as a child. So began his commitment to what he refers to as "the work of a lifetime" and he says "my study of Arabic was not only academically relevant and interesting but it also had a personal resonance and I discovered that really there was so much to do". Initially and partly through reading the secondary sources that were then available Burnett was under the impression that Toledo in Spain was the main point of contact between Arab, Christian and Jewish scholars and the place where most of the translations of Arabic manuscripts into Latin were done in the 12th and 13th centuries. But on closer scrutiny he discovered important centres in Sicily, southern Italy and significantly in the Middle East and he says, evidence suggests that translations of Arabic works of sciences began as early as the late10th century. He points to the fact that after the Crusaders arrived in the Middle East and after "they had done their bloody work", many settled in the Middle East. Amongst the settlers were scholars who were genuinely curious about Arab civilization and developed close and friendly contacts with Arab scholars. Consequently several important Arabic works on medicine and philosophy were translated and made available to Europe for the first time in the late 11th century and early 12th century. By the 13th century this friendly engagement had developed into what Burnett refers to as a "commonwealth of scholars for whom political and religious barriers evaporated". A typical member of this community of scholars would have been someone like Theodore of Antioch, a Syriac speaking Christian. He elected to go to what was then the leading place of scholarship in Mosul to study philosophy under a renowned Muslim scholar, the mathematician and theologian, Kamāl al-Dīn Ibn Yūnus. On completing his course he went to Baghdad to study medicine. He then began to search for a position commensurate with his top notch academic credentials and was initially offered and served a posting at the court of the Muslim Seljuk Turks who had established a dynasty in Anatolia. Here was a Christian scholar who had secured his education by seeking out the very best Muslim academic institutions of the time and was now employed at the court of a Muslim monarch – proof if needed that what mattered was what he knew and not his religious affiliation. From the Seljuk court he moved to the Armenian Christian court where he served Constantine of Lampron, who was the regent for the boy king Hayton I. By now his education and professional experience at both Muslim and Christian courts had conferred on him an international reputation and he was head hunted by Frederick II of Sicily and became his court philosopher. In his time, as Burnett emphasizes, Theodore of Antioch was a good example of an international scholar who sought out and got the best education he could in Islamic institutions and then served the rulers who offered him the best compensation package in the way of renumeration and conditions not to mention professional prestige. And Kamal al-Din Ibn Yunus under whom Theodore of Antioch studied, was a polymath who offered courses not only in Islamic theology and sciences but also in the Christian Gospels and the Torah and it is reported that Christian and Jewish scholars sought him out in order to study their faith under him. Figure 4a-b: A page from the Latin translation of Ibn Rushd's commentary on Aristotle's De Anima (French manuscript, third quarter of the 13th century, Paris, Bibliothèque Nationale, MS lat. 16151, fol. 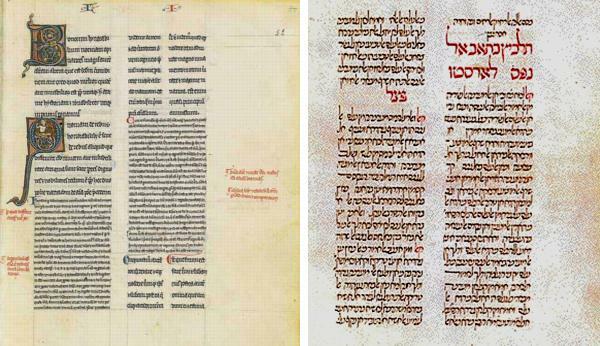 22 (Source) and a page from the transcription in Hebrew letters of Ibn Rusd's Talkhīs kitāb al-nafs li-Aristū (Epitome of the De Anima of Aristotle) (Pappyrus, Saragossa, 1402. Paris, Bibliothèque Nationale) (Source). If the range of subjects in Burnett's prodigious list of publications, covering the Latin translations of Arabic texts is anything to go by then it seems that the early European translators were hungry for any area of learning from the mundane to the erudite, from a whole gamut of practical skills to "the most sophisticated and academically profound explanations of the philosophy of Aristotle by Averroes, Ibn Sīnā and al-Fārābī". The Latin translators, says Burnett, "knew" that what "they wanted and needed,…. and they knew they could find them, in countries where Islamic civilization had been strong – in Spain, Sicily and South Italy where Arabs had been for a couple of centuries and in the Middle East". Schools of translations were set up in these centres. Some translators were Christian scholars who had traveled and some such as Theodore of Antioch were educated in Muslim institutions. But many did not have familiarity with Arabic speaking cultures and were assisted by Muslim and Jewish scholars. In Toledo Jewish interpreters, who had lived in Muslim societies and knew Arabic and were themselves familiar with the major Islamic works on medicine, astronomy and philosophy and played a vital role in translating Arabic works into Latin. This was particularly the case after 1140 when Jews were expelled from Toledo by the Almohads, who reconquered that part of Spain. Additionally certain Christian kings such as Sicily's Frederick the 2nd was exceptionally sympathetic to Muslims and welcomed Muslim scholars to his court. Sirāj al-Dīn al-Urmawī was one such scholar whose writings have survived. The Arabic medical texts that were translated included works on women's diseases. Burnett relates how in the Western tradition all texts relating to women's diseases were attributed to a mythical doctor called Trotulla. These had become incorporated into the Arabic treatises on women diseases and now made their way back into Europe via the Latin translators. Another specialism was the use Arab physicians made of music for recuperation and healing - known as spiritual medicine and described in detail by Arab doctors such as al-Rāzī. As Burnett points out though the West had a strong musical culture the idea of music as therapy was new. It was essentially a way of treating mental illness, which the Arabs regarded as physiological and caused by disturbance of the humours and not by evil spirits. The harmony of the humours was restored by playing particular musical instruments and by singing in hospitals wards. Texts on various kinds of vetinary medicine were also sought out such as horse doctors - an important area since fit horses were vital to any army, professional falconers who were trained to know how to look after birds and cure them of various diseases, dog doctors and so on. Each specialism of medicine human or animal had its own manual. By the time the Latin schools of translators had done their work the major Arabic treatises became text books that "were central to the bibliography" and you can see this, observes Burnett, if you look at any list of text books of the middle ages. So looking at the book list for the faculty of medicine almost every author was an Arabic author. For philosophy the main text book was Aristotle but students learnt their Aristotle through the commentaries of Ibn Sinna, al-Fārābī and al-Kindī. In astronomy the texts were from the Arabic. In geometry the main text was Euclid's Elements but read in translation from the Arabic. In arithmetic the Latin tradition was supplemented by the Arab inspired sub-divisions of the subjects particularly in trigonometry and algebra. How did the translators gain access to specific Arabic textbooks? As Burnett points out in Spain there were few ethnic Arabs. Most of the scholars in Spain were probably Spanish Europeans who had assimilated Islamic Arabic culture. But Arabic was the unifying language of the whole of the Muslim world from Morocco to Afghanistan and there is he says, considerable evidence of Arabic manuscripts being trafficked frequently and speedily from one end of the Islamic dominion to the other. Burnett refers to the work of the scholar Dimitri Gutas who makes the point that when the Caliphs established their capital in Baghdad in 750 they adopted a deliberate policy of translating every thing from the cultures the Arabs had overwhelmed, into Arabic. Translating the learned texts of the Greeks, the Persians, the Syrians and the Indians gave the empire political and cultural unity and reflected the belief that with knowledge lay power and the power of any civilization lay in the written word, in its books. The library that Haroon al-Rashid established in Baghdad was the largest library outside China. Later in the 9th century when a separate caliphate was established in Spain in al-Andalus under ‘Abd al Rahmān the 3rd a major project of this Spanish Caliphate was to set up a large library in Cordoba rivaling the library in Baghdad. And it became after Baghdad the second largest library in the Muslim world. Arabic text brought to Italy by Greek scholars who fled Constantinople when it fell to the Turks in 1453. The text in question was authored by Nasīr ad-Dīn al-Tūsī, a leading astronomer who like Theodore of Antioch also studied under Kamāl al-Dīn Ibn Yūnus and who designed and supervised the construction of the Maragha observatory in Persia in the 13th century. Tūsī's Memoir on Astronomy (Al-Tadhkira fī ‘ilm al-hay'a) amended Ptolemy's work on the motion of spheres and led him to formulate the theorem known as the Tusi couple which states that linear motion can be derived from uniform circular motion. Tusi's manuscript contains a series of diagrams that demonstrate this, showing clearly one sphere rolling inside another of twice the radius. It has now been acknowledged that in his 'Revolutions' Copernicus reproduced the Tūsī couple. Tūsī's original experiment as reported in his Arabic manuscript was vital in enabling Copernicus to arrive at his heliocentric view of our solar system. Copernicus remained silent about his Arabic sources and it probably did not occur to his contemporaries to track the source of his inspiration to its Islamic origins. Burnett speculates that this may have been the beginning of the rot that set in and the gulf that has become ever wider as Europeans became increasingly unwilling to admit that they may have been indebted to Islamic and other cultures for ideas that caused them to look at the world in a different way. How different from the 12th century when, as Burnett emphasizes, European scholars were inclined to boast and proudly advertise the fact that they acquired their learning from Arabs and how Arab knowledge in the field of astronomy or medicine for instance was far superior to any that could be found in the most superior Latin institutions. 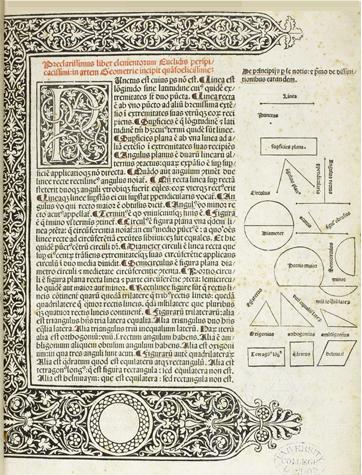 In the 13th century Leonardo Fibonacci the Italian merchant turned author of European's most influential book on mathematics writes with pride of his early training in Algeria on the Arab way of doing arithmetic, at the behest of his father. In his preface to Liber Abbaci he pays unabashed tribute to Hindu, Arabic and Greek mathematical know how and how he came to learn enough to be able to write his book, through his close and friendly connections with Arab /Islamic scholars and traders. "I joined my father after his assignment by his homeland Pisa as an officer in the custom house located in Bugia (Algeria) for the Pisan merchants who thronged to it. He had me marvelously instructed in the Hindu-Arabic numerals and calculation. I enjoyed so much the instruction that I later continued to study mathematics while on business trips to Egypt, Syria, Greece, Sicily and Provence and there enjoyed discussions and disputations with the scholars of those places. Returning to Pisa I composed this book of fifteen chapters which comprises what I feel is the best of the Hindu, Arabic and Greek methods". Another very visually striking example of this mindset which acknowledged that Europe rediscovered it's own past through it's ties with Arab and Islamic cultures can be seen in the pages of a deluxe edition of another book that was printed in Venice in 1484. The book is Aristotle's Works. The Latin text incorporates Aristotle's philosophical works as well as commentaries to his works by leading Arab philosophers. Both the Works and the commentaries were sourced from Arabic translations by Gerard of Cremona, a prolific 12th century translator who worked in the translation schools of Toledo. This very lavishly illuminated book had each page of text framed with lush painted scenes. At the top of the page is painted Aristotle sitting on a rock debating with a turbaned scholar. This turbaned scholar is none other than Averroes or Ibn Rushd. European scholars of the time regarded the Muslim Averroes as the translator and interpreter of Aristotle par excellence. They referred to him as "the mind of Aristotle incarnate" and no one in Europe at the time felt his equal. What better acknowledgement of the close contacts and indeed as Charles Burnett emphasizes, friendly contacts between Europe and the Islamic world during the so-called "dark ages". A full list of publications by Professor Charles Burnett is available at: http://www.sas.ac.uk/warburg/institute/cburnett.htm. Charles Burnett, The Appreciation of Arabic Science and Technology in the Middle Ages. Charles Burnett Arabic Medicine in the Mediteranean. Charles Burnett Leonard of Pisa (Fibonacci) and Arabic Arithmetic. * Professor of the History of Islamic Influences in Europe, Warburg Institute, University of London.